We've had the pleasure of testing a wide array of large monitors in our time, but nothing quite like the Philips Momentum 436M6VBPAB. 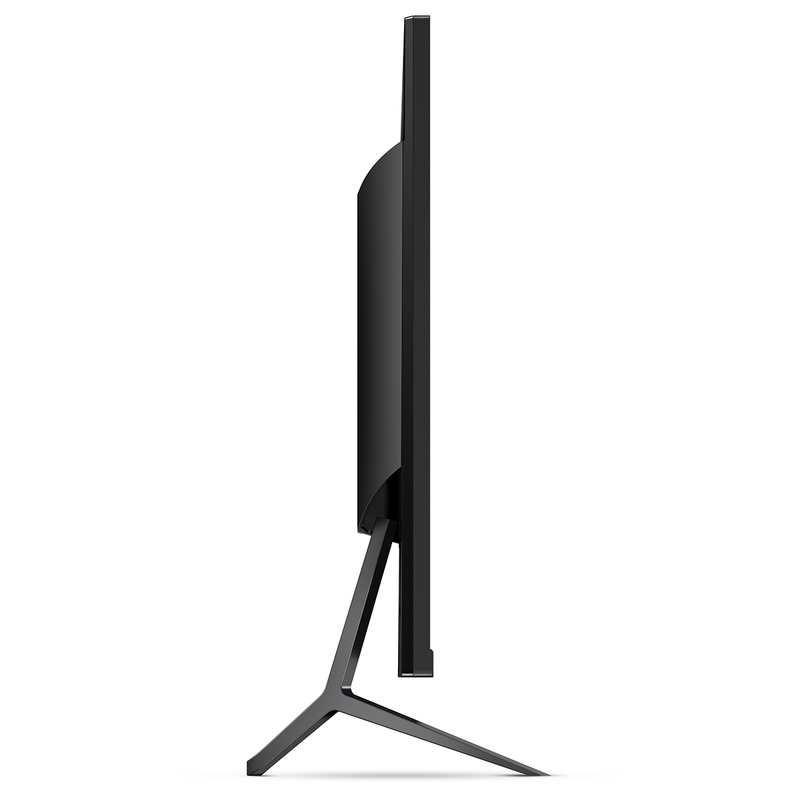 This giant 43in HDR display looks more like a TV than a monitor, yet has no built-in tuner and is geared toward desktop usage scenarios. Connect a PC via DisplayPort and you have a huge high-resolution canvas on which to create content, manage spreadsheets or simply browse the web. Attach a games console via HDMI and you can experience 4K HDR thrills, as well as smoother action on an Xbox One courtesy of baked-in support for FreeSync adaptive framerate synchronisation. A fascinating proposition for those seeking a one-stop solution for both console gaming and PC work, but with a £700 price tag, the super-sized Philips raises a few question marks. Is it worth the fee when 43in 4K HDR TVs are readily available at around the £400 mark? Can a panel of this size be comfortable for regular desktop use? And has the PC HDR experience improved to make it worthy of consideration? There's a lot to ponder, so let's get stuck in. Opening the 436M6VBPAB's rather large packaging feels a lot like unboxing a new tele. 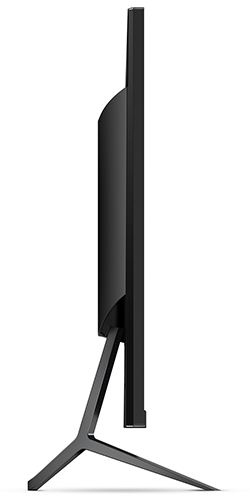 The stand is pre-attached, the glossy bezel is reasonably slim, and along with the cables there's a remote control included in the box. First impressions are that of a moderately attractive set whose removable dark-grey aluminium stand adds a little bit of finesse. We like the fact that the base isn't too deep as to take over the entire desk, and there's enough space in between the legs to neatly stow a keyboard and mouse. Neither the bezels nor the profile are the thinnest we've ever seen, yet it's a suitably modern-looking frame, and there's Ambiglow lighting attempting to enhance the feeling of immersion. We're quite fond of the Ambilight mood lighting on Philips TVs - projecting colours that reflect what's on screen to nearby walls works really well - but as the Ambiglow name suggests, the effect is more muted on this 43in monitor. Rather than lining all sides of the panel with RGB lights, Ambiglow is restricted to two relatively small strips on the underside of the monitor, and even on its brightest setting, the glow isn't particularly effective. It isn't a bad feature to have, and we're inclined to leave it turned on, but if you've experience full-blown Ambilight, then Ambiglow will seem timid in comparison. Dimensions of 976mm x 661mm x 264mm (including stand) and a weight of almost 15kg are such that you're going to want a hand putting this beastie in situ. 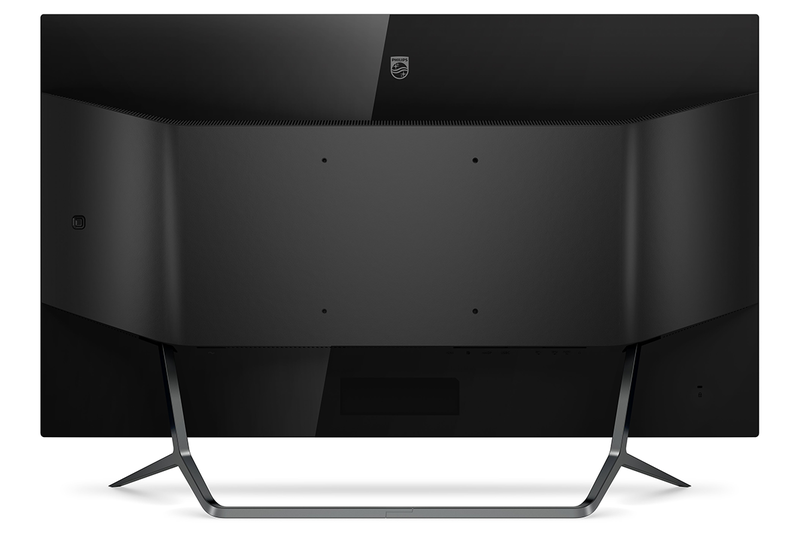 There's no height nor swivel adjustment, as is to be expected on a panel of these proportions, yet Philips has included the ability to tilt up to -5/10º and there's a 200mm Vesa mount on the back if you prefer to attach the panel to a wall. Build quality feels decent throughout, though if we're nitpicking, the status LED in the bottom corner feels cheap compared to the rest of the display; the illumination isn't bright enough to fill the entire strip, making it appear half-baked. What's handy is that Philips has put some thought into how the display is likely to be controlled. 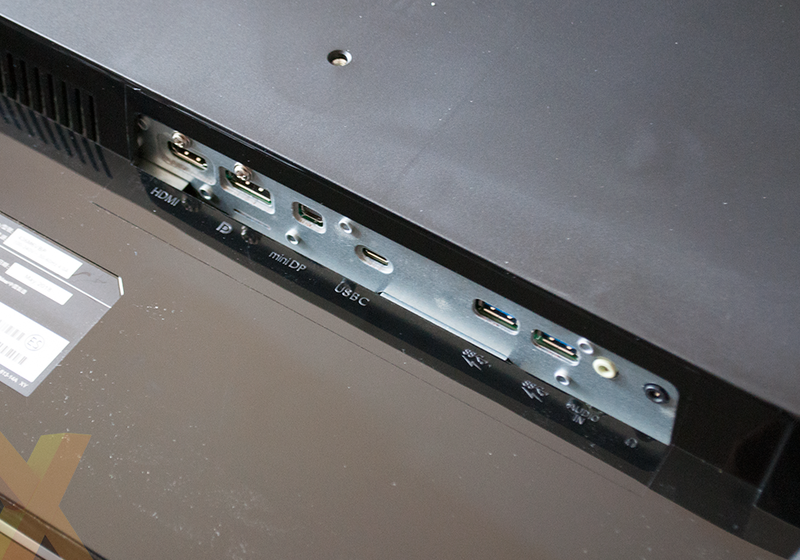 When up close, there's a joystick behind the panel that offers quick navigation of the OSD. If you're further away, say, playing on a games console, the small bundled remote takes over control duties, making it easy to power on or alter volume from a distance. 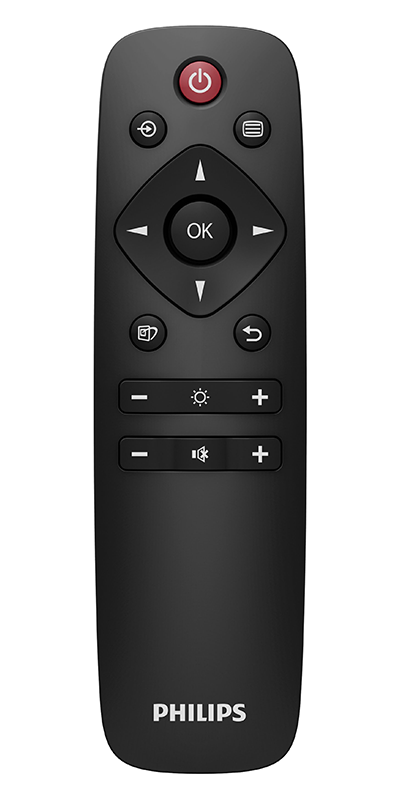 The only caveat is that the remote is IR based, so when up close you may find that button presses don't register unless you specifically point to the bottom-right corner. Still, on a monitor of this ilk, it makes perfect sense to include two forms of control as standard. 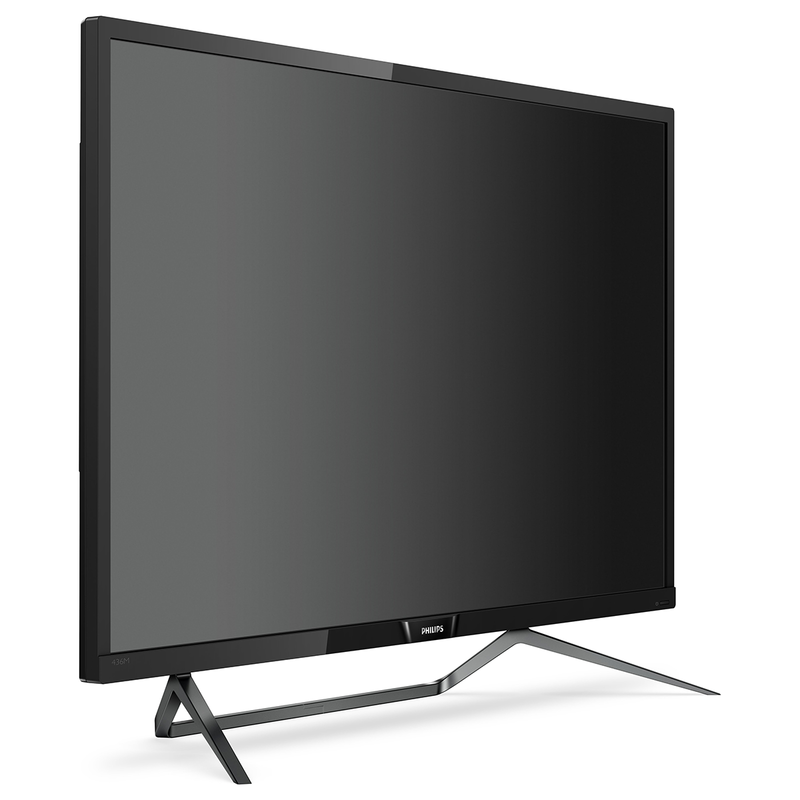 Size and appearance count towards the monitor's appeal, but it is the display specification that offers the most intrigue. 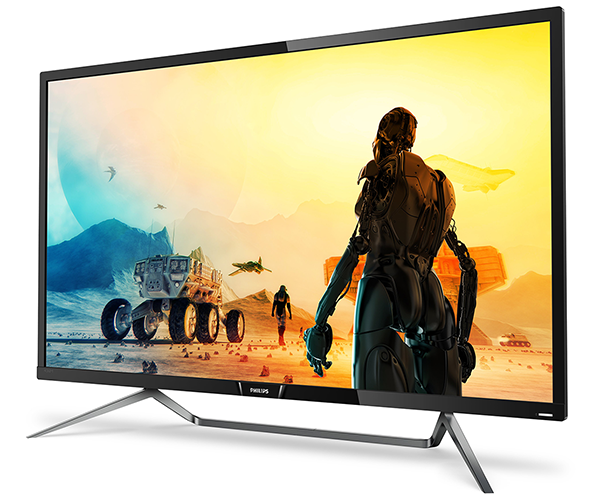 Philips is using a Multi-Domain Vertical Alignment (MVA) Quantum Dot panel touting a 4K UHD (3,840x2,160) resolution, 60Hz refresh rate, a quoted 4,000:1 contrast ratio, 4ms response time and support for AMD FreeSync. Furthermore, this is one of the first PC monitors to ship with Vesa DisplayHDR 1000 certification. Making sense of HDR on the PC hasn't been straightforward in recent years, but Vesa's DisplayHDR standards help simplify matters somewhat. 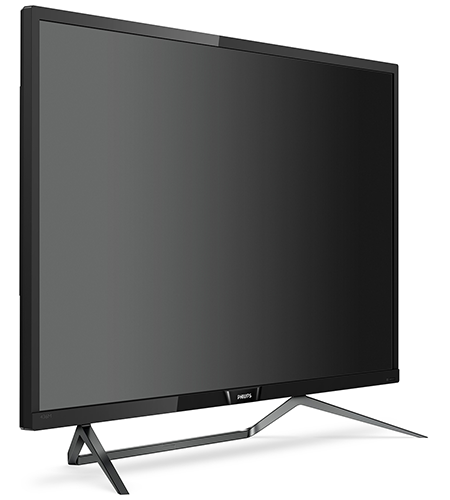 The 1000 rating is the highest available today, and ensures that the ultra-high-contrast Philips panel is capable of flash brightness of at least 1,000 nits, long-duration brightness of at least 600 nits, blacks as deep as 0.05 nits, and 10-bit colour, which Philips achieves by using 8-bit drivers and 2-bit dithering. This may not be a true 10-bit solution, yet it remains one of the better implementations of HDR we've seen on a PC monitor, and the use of Quantum Dot technology enables 97.6 per cent coverage of the wide DCI-P3 colour space. That translates to 145 per cent of the more commonly used sRGB space, but whichever way you look at it, colour coverage is superior to most. In terms of connectivity, Philips' port arrangement includes HDMI 2.0, DisplayPort 1.2, mini-DisplayPort 1.2, and USB-C with DisplayPort. A two-port USB 3.0 hub supports fast charging on both connections, and a pair of audio jacks round out the selection. Ample for connecting a PC and games console, yet given that the 436M6VBPAB bridges the divide between TV and monitor, we'd liked to have seen more than one HDMI port. This is ultimately a 'dumb' set, and with no built-in streaming services, it would be handy to be able to connect both a games console and, say, a Fire TV Stick. Port selection could be better, but we've no qualms with the integrated DTS-certified sound system, as the upward-firing 7W stereo speakers are surprisingly convincing. The results aren't quite good enough to retire a dedicated soundbar, yet we don't recall ever hearing a monitor with integrated audio as loud, clear or punchy as this. There's plenty to get excited about, however there are a few drawbacks to consider, too. Though the 178º viewing angles of the VA panel are sufficient for a screen of this size, you will notice some vignetting when you're sat up close as the edges of the screen appear slightly more faded. Uniformity hampered by 32-zone edge-lit dimming happens to be one the panel's weak points, and it's when used as a desktop monitor that you tend to notice these niggles. Dark scenes with distinct illuminated sections can cause flooding from the edges of the screen, while an unusual BGR (blue, green, red) subpixel layout results in some frayed text and a checkerboard effect that is noticeable at times when you're sat with the panel right in front of your face. Question marks can also be attached to some of the headline features. HDR can be breathtaking when done right, but on the PC the experience leaves a lot to be desired. 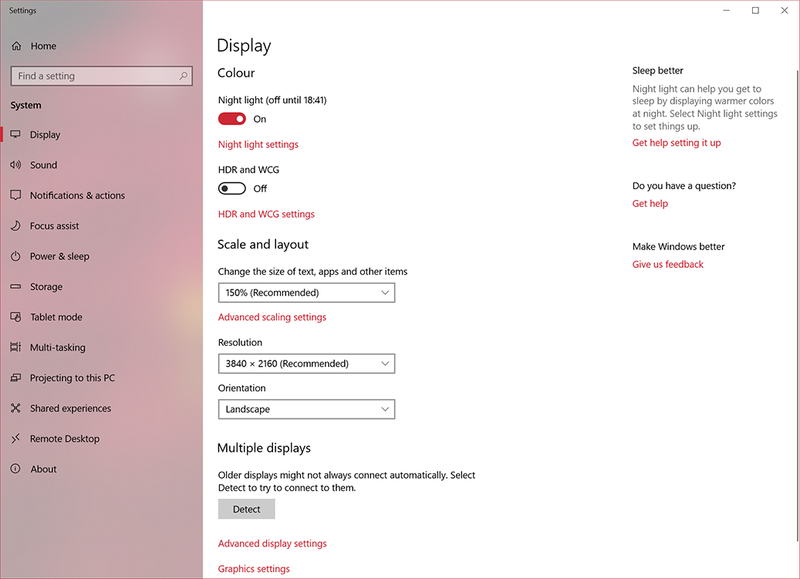 Turning the feature on in Windows 10 requires toggling the 'HDR and WCG' (High Dynamic Range and Wide Colour Gamut) setting in control panel, and doing so results in all SDR content - which is most of the operating system - appearing washed out and dull. It is jarring having to toggle the setting whenever you wish to watch a HDR video, and though some HDR games can flick the switch automatically, others won't, resulting in an inconsistent experience. 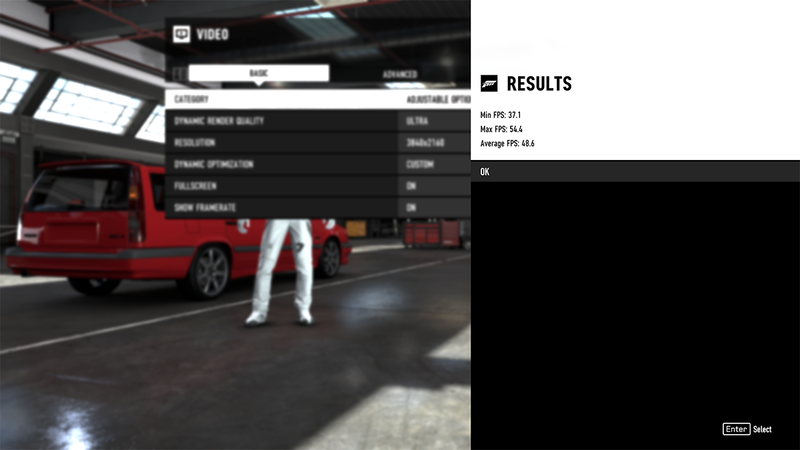 Adaptive framerate synchronisation is in our estimation a must-have feature on a gaming display, yet the Philips implementation leaves room for improvement. Rather than adopting FreeSync 2, the standard FreeSync on offer here doesn't support low framerate compensation and operates at a limited range of 48 to 60Hz. 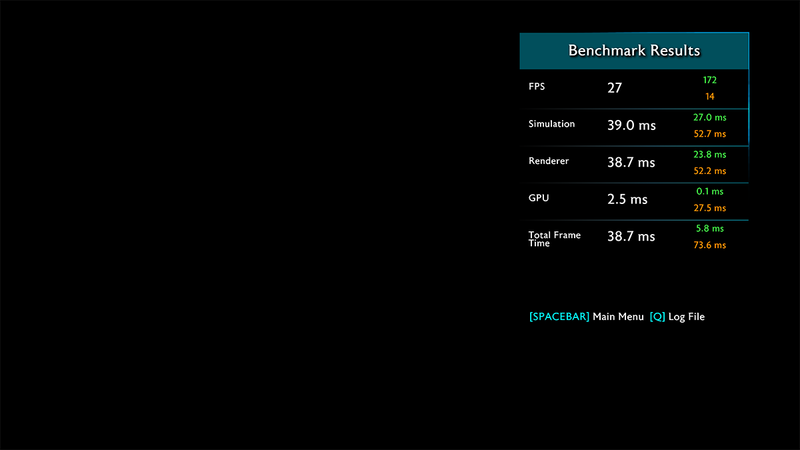 It's also worth pointing out that, while manufacturers prefer to take AMD's low-cost FreeSync route, AMD GPU's struggle to drive smooth 4K UHD gameplay on PC. 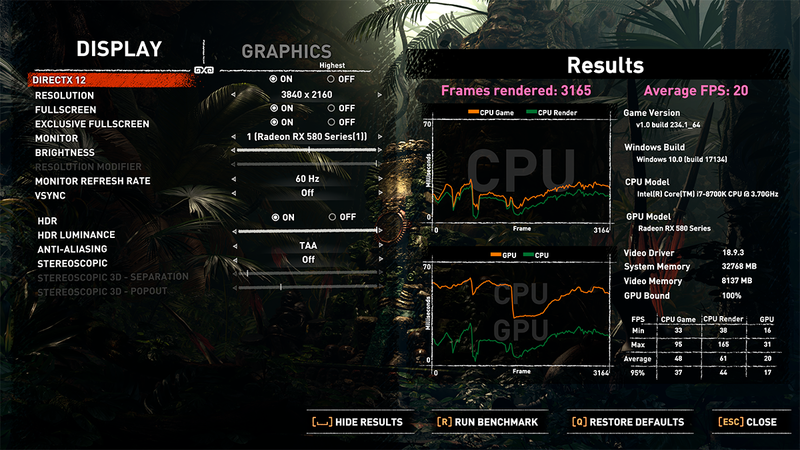 We ran a handful of HDR-enabled games using a Radeon RX 580 and managed 27fps in Far Cry 5, 49fps in Forza Motorsport 7, 27fps in Middle-earth: Shadow of Mordor, and just 20fps in Shadow of the Tomb Raider. 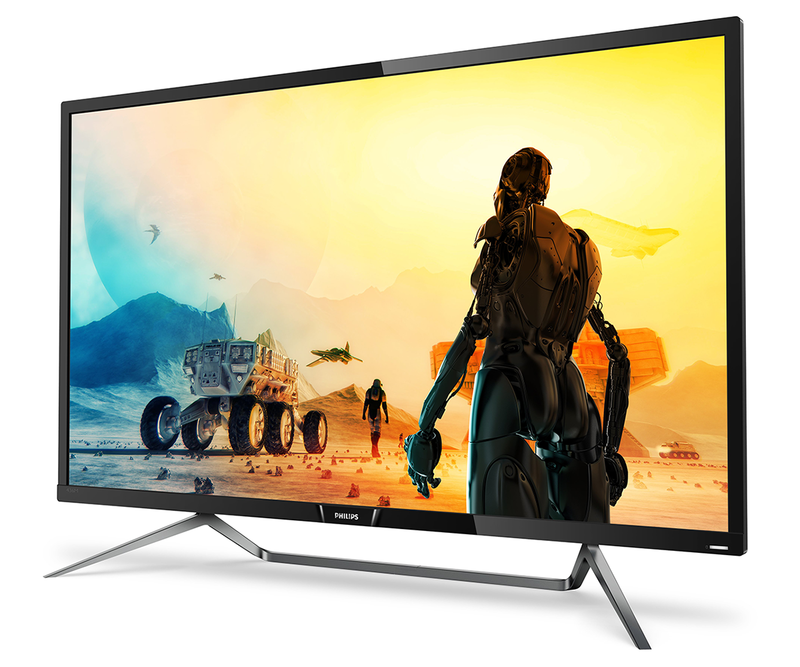 Gaming on the Philips is nevertheless pleasant due to suitably fast response and hardly any perceptible lag, yet we can't help but feel as though PC users would be better served by, say, a QHD panel with a higher refresh rate. 60Hz is basic by today's standards, and if you're willing to forego HDR, which delivers mixed results in the PC games we've tried, it's possible to pick up a considerably faster panel for less money. Many of the aforementioned issues are outside of Philips' control, but during our time with the 436M6VBPAB we've come to realise that it ultimately isn't ideal as a PC monitor. 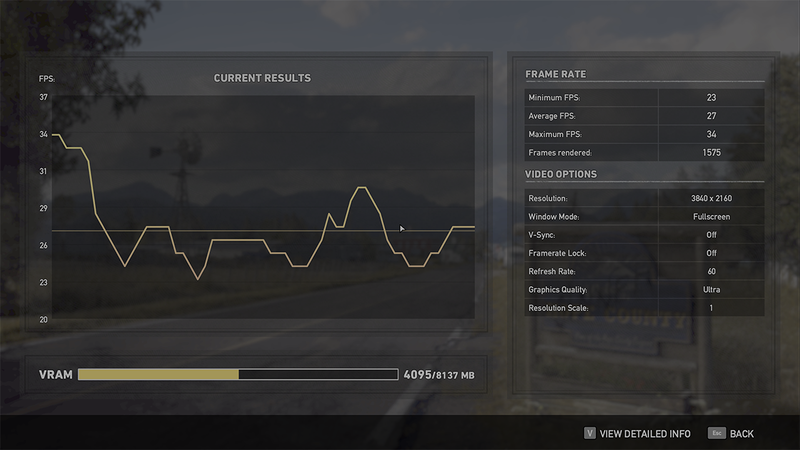 The size and sheer brightness of the screen can be uncomfortable during up-close use, HDR on PC just doesn't feel ready, and there isn't yet a Radeon suited to gaming at the native resolution. The Philips can of course function as a PC monitor, and some may well appreciate the giant canvas, but the image is best enjoyed by taking a few steps back. That being the case, an Xbox One X is surely the preferred companion; Microsoft's games console can drive 4K HDR gaming and also supports FreeSync, positioning it as the ideal choice for making the most of the Philips display.